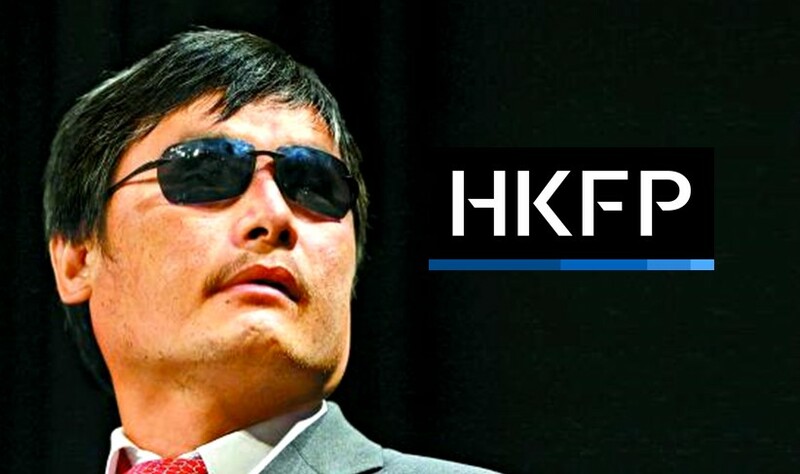 Chinese human rights activist Chen Guangcheng made headlines around the world in April, 2012 when he escaped house arrest to seek refuge in the US embassy in Beijing. 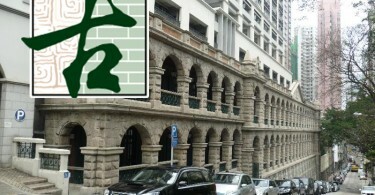 Chen fled under the watch of dozens of guards with the help of friends and supporters. Blinded since a young age, Chen taught himself law and has used it to fight against forced abortions and the unfair treatment of the disabled. Chen Guangcheng. Photo: Apple Daily. HKFP: Could you please tell us a little bit about what you’ve been doing recently? What are you doing in the US now? I’ve been researching China’s freedom, human rights and internet control in cooperation with the Catholic University of America and the Witherspoon Institute. I also study American policies on human rights. HKFP: Was the purpose of your UK trip to take part in protests against President Xi Jinping? Are you going to give speeches in universities or the parliament? Yes, yes, I came here this time to support the demonstration for Hong Kong to fight for freedom, democracy and human rights, to support people who made an effort in all aspects to fight for freedom. Of course this includes the rights defenders in mainland China, human rights lawyers and people who are suppressed by the Chinese Communist Party. People should pay attention to the issue of human rights because human rights are like air, they should be treated as the most basic things, and not just compared with business. No university speeches so far, but this afternoon we went to the British parliament to meet a delegation of MPs from different parties, the chairmen and vice chairmen of parties, to discuss this [human rights] issue. HKFP: How has the human rights situation in China changed since you left more than three years ago? I don’t think much has changed. The crackdown now covers wider aspects, the way they break the law is even more reckless, more open now. So I think in reality the violation of human rights is worsening. Even though Zhou Yongkang was arrested, [the Communist Party] is still walking the way Zhou walked, using the means Zhou used. From July till now, the outside world in general thinks over 300 people were targeted in the crackdown on human rights defenders, lawyers and their families. But according to what I know, 27 people were arrested in Linyi city alone, and more than 200 were arrested in Shandong province. This means the total number of people persecuted or affected in this crackdown could add up to at least over 2,000 across the country. 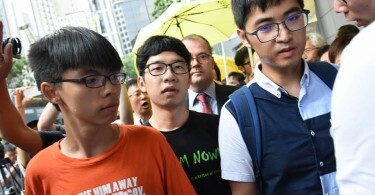 HKFP: The people who were arrested in Shandong, were they lawyers? Some were petitioners, some were human rights defenders and some were barefoot lawyers, all kinds. Overall, if you want to express your needs or speak the truth [in mainland China], you will be suppressed. HKFP: Were your family in Shandong affected in this crackdown? Now my family are OK, even though they still get harassed, things are not so serious any more. My nephew Chen Kegui was released from prison on July 29. Over the past more than three years the Chinese Communist Party didn’t shorten his sentence by one day. And the fact that he was only defending himself was never recognised. This is also a kind of extended persecution on me. What’s more, at the beginning some plainclothes officers were always watching [my nephew], then the situation got better, now there’s no big problem. HKFP: Earlier the Chinese ambassador to Britain, Liu Xiaoming said President Xi Jinping will not shy away from human rights questions, but would not be pleased to be lectured by the UK on human rights. The Chinese government insists it has another set of values and systems on human rights, which is different than the Western one and is based on the unique situation in China. What do you think about that? I think this is a nonsense theory. Different than the West? Who is the West? Britain and America are different, Britain’s northern and southern parts are different, America’s central, eastern and western parts are all different, every place is different. Using this as an excuse does not make sense. Not only is China different than the West, every place in China is different than another place, then why is all of China using the same unreasonable system? So I think these are all excuses. Of course on China’s human rights issue, if the Communist Party says it doesn’t shy away from it, then come out and have a debate with us! Tell us publicly what you think is right about China’s human rights. Then why did they avoid all requests about [debating] human rights? Earlier when the US released a report about China’s human rights, Chinese ambassador Cui Tiankai said the report was against facts. Then American Congressman [Chris] Smith invited him to testify in Congress and tell us where the report was wrong. Then why didn’t he go? What is this if it isn’t shying away? So I think this excuse is very shameless. The CCP promised me through American negotiators that they would look into the people who persecuted my family, this promise still hasn’t been realised. What is this if it isn’t shying away? What can’t they investigate the facts? So this is what ordinary people call “official language”, it’s a nonsense theory and it’s against the facts. HKFP: Do you think the British government will raise human rights issues with Xi Jinping? I think it’s possible they will bring it up privately. But this kind of private talk has no real effects, because this means they put CCP’s face first. Questions are there, right in front of them, why talk behind the doors? Right? How would the British people know if they talk behind closed doors? So I think this is a sign of degeneration. Issues concerning social justice, concerning fairness and justice cannot be avoided, they should be put on the table clearly. HKFP: You’re quite active on Western social media such as Twitter and Facebook. You also speak to the media from time to time. However, because of censorship, most people in mainland China are unlikely to hear your messages. Many people may not even know who you are. How do you reach your audience in mainland China and communicate with them effectively? I think the reality may not be as pessimistic as that. I think many people in China do know. Maybe sometimes they know but they wouldn’t necessarily say they know. According to my knowledge, many people in mainland China use all kinds of means to go on Twitter and Facebook, or even read information on [Western] media. Of course I think even in an open society, not everyone will pay attention to the issue of fairness and justice. You cannot have a hundred percent of the population paying attention to the same issue at any time. So I think China is making progress as long as there are enough people paying attention to justice. In the past few decades the CCP spent more money on maintaining internal stability than on the military every year to try to control the society, control the flow of information and cover people’s eyes and ears. But we can see in the past more than a decade, the CPP cannot do that anymore, many information, even though it tried to block, the world found out. This proves it’s a game of “as virtue rises one foot, vice rises ten.” Of course it’s still difficult for many people to have access to outside information, but we can see more and more people do. HKFP: But many people in China think the idea of overthrowing the government and the party is too extreme and out of touch with reality. What do you say to those people? Many people living under the CCP’s claws may not express their true ideas. Sometimes they may hold another opinion to protect their own safety, but this opinion may not reflect what they think. That the CCP is all lies is a concept that even people at the most grassroots level know very clearly. Those who support the CCP are one in a million now. Even the CCP members are full of complaints. In China some things you can say but not do, some things you can do but not say. I understand very much when the Chinese people use another opinion to express themselves in order to protect their own safety. But in general, more and more people dare to speak out. HKFP: You and your family moved to the US more than three years ago. You now enjoy the freedom that many of your fellow human rights activists in China cannot enjoy. But at the same time, you have lost the opportunity to see your friends and relatives in China. Do you think you are lucky or unlucky? I think on the whole I am quite lucky. I didn’t get tortured to death by the CCP like Cao Shunli. I didn’t get tortured to death by the CCP like Li Wangyang. From this perspective I am really very lucky. But we also endured very cruel persecution. From when I was illegally detained at home, then sent to a black jail, then sent to an official jail, then I came home and it was even worse than in jail. I was subjected to even more brutal beatings. The torture lasted for 20 months, me and my family were not allowed to leave home, we were in a state of food deprivation. From this perspective it’s quite painful. This caused my family a lot of harm. But all in all, I escaped with the help of others and I gained true freedom. HKFP: Have you thought about going home to China? Can you imagine what it would be like? I think the day when I return to China will definitely come. Maybe it’s not now, but it won’t be too far away. Now I think people realise the CCP regime has lost its morale. You see CCP officials are all paving their way of escape by moving their families abroad, by moving their properties abroad. One official can have ten, 20 or more passports. What are they doing? They’re saving a way of retreat and preparing for escape. Why? If you can do whatever you want in an authoritarian regime, why do you want to run to America, Britain and places like Europe? Obviously they don’t have any faith that this regime is going to last long. Many examples like this are happening around us. These officials doesn’t have the slightest confidence in Communism. Rarely anyone will say they believe in these theories and scams. This has gone bankrupt, now they can only use violence and bribes. Why so many people are still playing along with it? Because they can still get some money. So I think the history of the CCP controlling all of the power in China has gone and will never come back.